Sorry I’ve been absent. This has been a challenging year for my family. My mother passed away. My father-in-law has had health issues. Hubby retired. I left my job and joined another pre-money start-up. So here I am, 11 months into life with Juliet, and I do have to say that she’s fitting into the family well. She’s not completely housebroken (a poop on the carpet yesterday proved that), but she’s on a schedule that works. As long as we stick to that schedule…we’re golden. If WE mess up…well, let’s just say that yesterday’s poop wasn’t HER fault! A novel idea, yes? That ‘accidents’ can be our fault. It’s true. We recently took a couple of weeks off and went to mid-coast Maine. 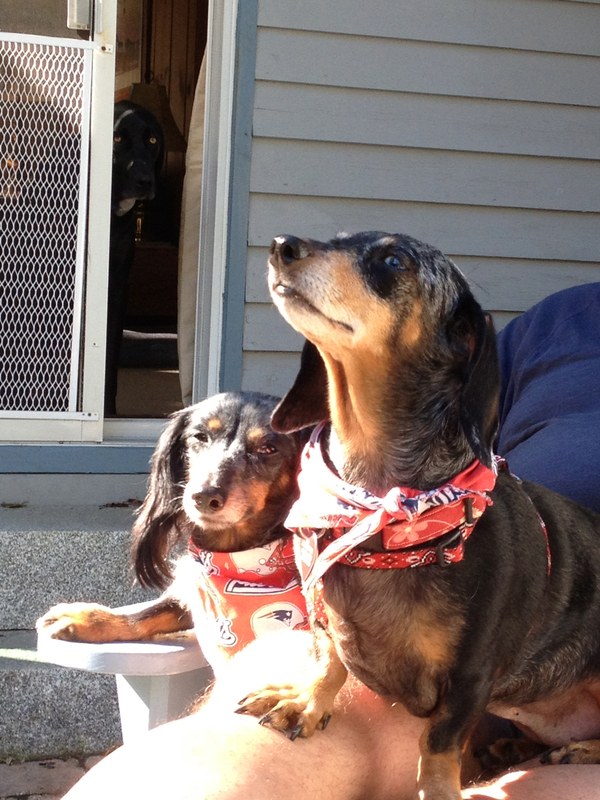 Of course, a vacation wouldn’t be as fun without the pups, so off in the doggie sling we went! We did have to get a barrier to prevent Juliet from jumping into the front seat some time ago, but since then, both dogs have been pretty good in the car. Jasmine still prefers to burrow, so we often find her UNDER the doggie sling. I need to find a solution that works for her (blankets don’t work) that will keep her safely in the sling AND happy. Vacation was a blast. Both dogs were immediately comfortable in the vacation house (my sister-in-law’s vacation home). We had a little yard for the dogs to run around in, and we took them out for walks while we were exploring the area. We also were lucky to time our vacation so we could attend the Belfast Wienerfest! 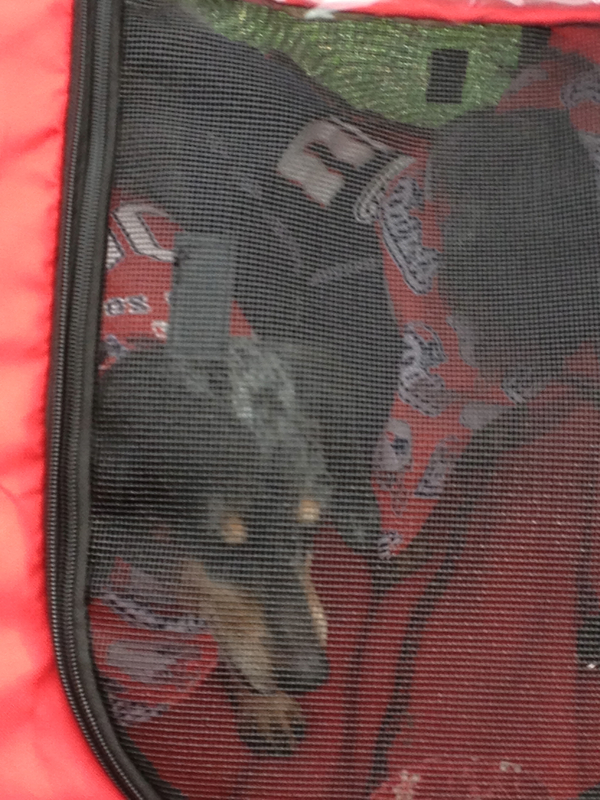 We dressed the gals in some spiffy outfits and took them for a spin in the new doggie stroller/bike trailer. Both were a hit! The doggie stroller/trailer was a HUGE help to us during the vacation. 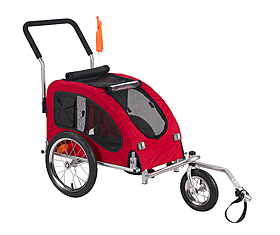 It’s a Merske Medium Bike Trailer/Stroller that I found at Overstock.com. With a coupon (wait for those), I paid about $150. The versatility of this trailer is great, and it works well. Hubby forgot the handle at the back, so we went to a hardware store and, with the help of one of the great salespeople at Aubuchon, we made a handle out of PVC for about $15. The great thing about this trailer is the accessibility. There are zip panels in front, back and up top. However, the one negative is that there is NO storage except for two small pockets on the side. The bike trailer bar folds under the trailer while not in use. Very nice! Okay, back to the vacation. The dogs were really put into new/stressful situations, and both did SO well. They loved being with the pack and adjusted well to the changes. I’ll write soon about the challenges we’ve faced with both pups since Juliet arrived. But I am SO happy to see how Juliet has thrived and how much Jasmine has really come out of her shell since Juliet joined the pack. Oh–we heard Juliet bark for the first time on this trip. Strangely, it was at an old black Labrador Retriever. The same kind of dog that Jasmine barked at the first time we heard HER bark. So, we have two (relatively) non-barking Dachshunds. How did that happen??? I’m not complaining, mind you. We have a really great matched set here! Jasmine loves home. Home is her domain, her safe place. When we go on walkies, she is happy to come home and she bounds into the house when we return. Her fluffy pillows, her numerous ropey toys, and her comfy dog beds are here. I spend much of my day with her here. When we go outside, she always jumps at the chance to go back in. She’s a house dog, and home is where her heart is. However, our home is going through changes. We will be moving next year, and we’re in the beginning stages of sorting through our piles of stuff and clearing out the clutter. We’ll then move to remodeling certain parts of the house to prep it for a sale. All this means major changes to Jasmine’s fortress over the next year. Little by little, the things that are familiar to her will change. Except us. She’ll always have us. When we move, we anticipate that it will take her time to once again claim her domain, make our new house her home. But as long as she has us, she’ll be home. People who rescue animals look for ”forever homes” for their keep. They don’t know how true those words are, because Jasmine is forever a member of our family. A few months ago, I suspected that Jasmine is a “morning” dog. Horror of all horrors, I actually have an EARLY morning dog. My husband gets up at 5:30 a.m. to get ready for work. After showering and dressing, he takes Jasmine out for her morning business and then fixes her breakfast (which, unfortunately, she doesn’t eat until I get up). He leaves for work, and she comes running down the hallway to the bedroom where I am sleeping. Well, not really. The sound of thundering hooves and jingling tags usually is enough to wake me up. She jumps and scratches on the side of the bed, welcoming me to a new morning. She whines and jumps, running from one side of the bed to the other. I have tried playing “possum” and not moving or making a sound–one time for over 30 minutes. She doesn’t waver in her determination to wake me up. I have even tried picking her up and snuggling with her in bed. No dice. She squirms and sniffs and rolls around. As soon as I’m up, her tail wags and she jumps with glee. Mom’s up! She goes tearing down the hallway and waits for me to enter the kitchen. She then proceeds to wolf down her food. While I’m not really thrilled about getting up at 6:15 a.m., it’s so wonderful to be greeted every morning by a happy, smiling dog. You can’t be grumpy when a dog looks at you with love and joy. You just can’t. Given our search to find places to take our dog, what have we found? Here are a few places we like. 1. Bill’s Cafe, San Jose (on Willow near Lincoln). Lovely outdoor patio with about a dozen tables. Outrageously good Bread Pudding French Toast. Water bowls for the pups. They’ll also give you some cheese if you forgot your doggie treats. VERY busy on the weekends. 2. Willow Glen Frozen Yogurt, San Jose (corner of Willow & Lincoln). While their name says frozen yogurt, they are best known for an outrageously good French Silk Custard. Nice seating outside. Short on parking, though. I asked the counter guy what he serves dogs, and he gave me a little sample cup of French Silk Custard for Jasmine. This was Jasmine’s first taste of ice cream, and she went nuts for it. I, too, am nuts for the French Silk Custard. However, they have this Wow Cow stuff for those on diets. Lactose-free and sugar free. I don’t know what it’s made of, but it’s a great treat if you’re on a low-carb diet. 3. Cup N Saucer, San Jose (corner of Meridian and Blossom Hill in the Princeton Plaza shopping center). Outdoor dining with heated lanterns during the cold season. While not particularly “dog friendly,” they do allow dogs on the patio. Of course, they also look away from smokers on their patio. Their breakfasts are good. Good omelets, awesome potatoes, great scrambles (my favorite is the Veggie Pesto). Prices are a bit steep. 4. Lenny’s Deli, Carmel (Carmel Plaza, Lower Level). I hear that they even have a doggie lunch menu. Outdoor patio dining. VERY yummy, but a bit pricey. 5. Carmel, California. Carmel is a very pet-friendly town. Their tourist map even shows establishments that allow pets, and there’s a dedicated web page with those listings as well. Water bowls are found all around town, and dogs are welcome in most stores. More importantly, dogs ARE welcome on their beaches. We were in Half Moon Bay later in the week, and we found out that the State beaches in the area did not allow dogs–even on leashes. Bah. Well, I guess irresponsible dog owners who don’t pick up after their animals have spoiled it for all of us. 6. San Jose Dog Parks. San Jose has dog parks! Yay! I like a town that likes dogs. I’m glad I live here! I was on the road the other day, and I drove by the Los Gatos Creek Park. They have a dedicated dog park there. When I arrived, I found out that they have a $6 day use/parking fee. Ridiculous. I think I’ll stick to San Jose. These are only a few of the places that we’ve been to thus far. I’ll continue to list new places as I find them. We have been taking Jasmine to different venues with us to further socialize her. However, finding places that are friendly to dogs is difficult. I have been looking at sites like Dog Friendly and recently bought the book Dog Lover’s Companion to California to find places that we can go eat and play with Jasmine. While the Dog Lover’s Companion book gives excellent reviews on dog parks, the hotel and restaurant listings range from detailed to generic (“allows dogs on outdoor patio”) and the number of listings per city leave a lot to be desired. The Dog Friendly site seems to have more listings, but the lack of detail is disappointing; their companion book is more like a AAA book–cursory information about a city and basic listings (at best). When it comes to finding places that allow dogs, you basically have to go visit and see where people are congregating with their dogs. The books do provide some surprising information (dogs are allowed on Muni and Cable Cars, for instance, and are welcome at Stanford Shopping Center and Santana Row), but in essence, it’s hard to tell until you get there. That becomes problematic when you’re contemplating a free-form day in a particular area. For instance, we were thinking about going up to Marin County for the day. Before we left, I decided to check to see if dogs were allowed in Muir Woods…alas, the answer was NO. Since Muir Woods was to be our primary place to walk and explore, we nixed the idea and decided on other areas instead. Most restaurants with outdoor patios with separate entrances generally allow dogs, but again, you need to check beforehand. Dog travel takes advanced planning, whether it’s just out to the store for errands, to a nice breakfast on the weekends, or a weekend or week-long trip. That’s kind of a shame…we’re really into roaming and exploring for the heck of it. Regardless, we’ve been happy taking Jasmine with us. She’s getting better at dealing with new situations and commotion…although it takes a few minutes and treats to calm her down. We took a much needed day off on Tuesday to celebrate my birthday, to decompress from the past week’s challenges, and to just enjoy the day with the dog. We went down the coast to Monterey and Carmel. It was a beautiful day…the fog burned off just as we arrived in Monterey. We parked near the Aquarium and walked down Ocean View Boulevard into Pacific Grove, all the way down to Lover’s Point Park. There is a lovely walking/biking trail parallel to the street. However, only the bike trail is paved. The walking trail is sandy–yet another lovely new experience for Jasmine. It was a great day for a walk–sunny but cool. We stopped at various benches along the walking trail to give Jasmine a little water and a little break. We didn’t know how far she could go without tiring, so we let her soak up the views and the experience. And oh, what an experience! Sea gulls! Seals! Other dogs! Joggers! Bicyclists! People! While Jasmine cowered at a lot of the people who passed by, she did well. She enjoyed the walk…ears back, mouth open, tongue lolling in a doggie smile. Her healthy coat shined in the sun. It was a beautiful day. When we reached Lover’s Point Park, we were disappointed to see that it was yet another “no dogs allowed” park. I guess I understand. Many people do not clean up after their dogs. Us…we depend on that roll of blue plastic bags every day. After walking back to the car, we headed for Carmel–a VERY dog-friendly town. People were stopping us on the street, asking about our little cutie. Dog bowls with water were out on every block. By the time we made it to Carmel, we were very hungry. We ended up at a deli in the upscale “mall” on Ocean Avenue. Jasmine was the proud recipient of some very yummy pastrami that just happened to “fall out” of Tom’s sandwich. *Ahem* We walked around town, which was a bit tough on Jasmine. She was very intimidated by all the people around, and she skitted around a bit. After a long walk around the center of town, we headed down to the beach. The beautiful water and white white sand were really another eye-opening experience for Jasmine. She was a bit hesitant about the loss of footing in the sand, but we coaxed her down the hill and to the water’s edge. Of course, she looked exceedingly cute with sand on her nose. We decided to head on home. We had walked quite a bit throughout the day, and all three of us were quite tired. Jasmine fell asleep as soon as she settled into her fluffy pink pillow in the back seat of the car. It was a beautiful day…a great way to relieve the stress of the week and to reconnect. Another step to socializing Jasmine and showing her the world. My father passed away a couple of days ago. We were on our way to Boston to visit family, and when we arrived in Los Angeles for our connecting flight, I turned on my cell phone. I had three voice messages. And I got the news. We were lucky to be able to turn around and fly home without too much trouble. The next morning, we went to make the funeral arrangements. We then went to pick up Jasmine from the kennel. Those who say pets reduce our stress levels and enhance our lives are SO right. When we got home late Tuesday/early Wednesday, the house was empty without her. Petting her, taking care of her, having her by my side is so soothing and great. Even though I don’t have much to smile about, she can make me smile just by being herself. I’m so glad she came to us. While I know that we have given her a much better life, I think we got the better end of the bargain. Words can’t express how much she’s added to our lives. We went to visit my father in the care facility on Saturday (as we do every weekend). We get together every week to have a meal and visit, and my Mom enjoys getting out and about as well. We’ve been taking Jasmine with us to both socialize her (she now is less hesitant about wheelchair ramps and elevators) and to cheer up my dad. I cooked a nice meal this weekend, including a Taiwanese chicken dish we all like. Dad dropped a couple of pieces on the floor when he was eating, and all of a sudden the “no table food” rule kind of flew out of the window. Jasmine greatly enjoyed the chicken pieces, and dad had a scavenger dog sniffing around his wheelchair. I guess Jasmine is over her wheelchair fear! 🙂 Now I know what to use as a high-value treat for training. But I wonder if she’ll eat the chicken without the garlic/ginger/sesame oil/soy sauce infusion? She is SUCH a picky eater! Jasmine growled at a friend who came to visit the other day, and she sometimes growls at my husband! Yipes! We’re starting obedience school after Labor Day weekend, so I hope to address that issue (as well as others) then.